In his equally beguiling and disturbing photographs, sculptures or films, Kader Attia (* 1970 in Dugny, Seine Saint-Denis) is often depicting aspects of European colonialism. In 2005, Kader Attia was nominated for the Marcel Duchamp Prize. In 2012, he participated with The Repair from Occident to Extra-Occidental Cultures in dOCUMENTA (13) in Kassel. In 2016 he recieved the Marcel Duchamp Prize. He lives and works in Berlin and Algiers. 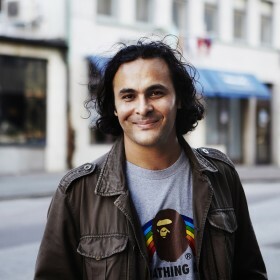 Kader Attia receives the Kunstpreis Berlin 2014 of Akademie der Künste in the section Fine Arts. Kader Attia's commissioned work on "Jacob's Ladder" is on show at Whitechapel Art Gallery in London from 26 November 2013 until Autumn 2014.